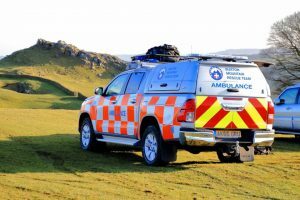 A walker who had set out from Longnor with a group of friends had enjoyed the views from Parkhouse Hill and Chrome Hill on a clear day. 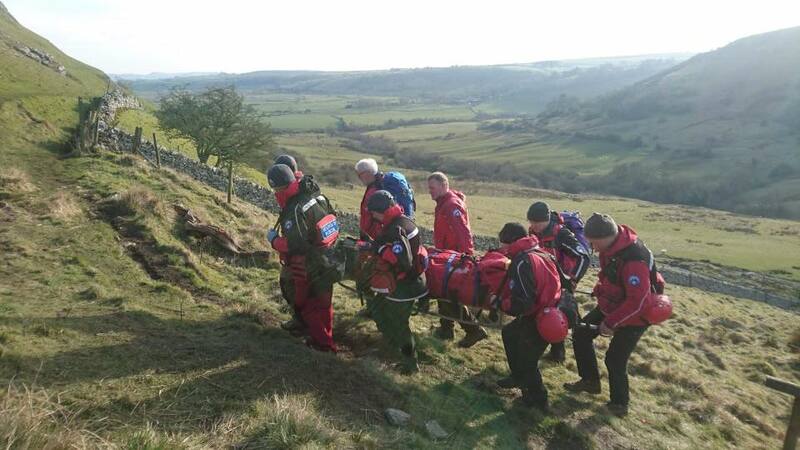 Then on the descent to Hollinsclough had taken a slip and injured her ankle and the group called for help. The team responded and treated the lady with pain relief. The lady was then transported to Mobile 3 to await East Midlands Ambulance Service and then on to hospital. The lady’s friends were then transported back to their cars in Lognor. I am the lady you rescued on Saturday. I would like to thank each of you for your time and help on that afternoon. I was taken to Macclesfield hospital, operation was Sunday to insert pins and plate as I had fractured my ankle. I was in a lot of pain, but wasn’t sure if it was just a bad sprain…when I saw 18 of you had turned out to help, I thought I hope I’m not wasting your time and perhaps I could try and walk …??!! I’d also like to thank everyone that descended the hill that afternoon as they all left us with either a foil blanket or food and some even made sure help would be able to find us by going to the near by farms and roads.